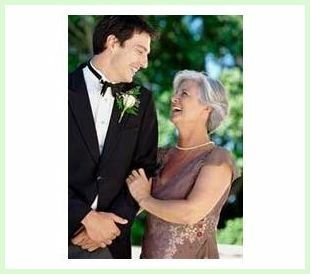 The mother of the groom speech is still a pretty rare thing, as is the mother of the bride speech. I have a feeling, though, that many more mothers these days want to speak at their daughters' or sons' weddings. We have lots to say... and quite often mothers are the ones who have raised their children and know them inside out. Hello, everyone. My name is Celia and I'm the mother of the groom. Thank you all for coming to attend our celebration today. It was a beautiful ceremony and we are about to have a wonderful party. Looks like some people have already started. Very good. I do hope you all enjoyed the ceremony. OK, the priest ran a little long. Little Emily here turned to me at one point and whispered to me, "Auntie, if we give him the money now, will he let us go?" Let me say I'm especially grateful that Eldon met Sara. Who knows where Eldon would be today without her? And an especially warm welcome to Sara's family - we are so glad to have you with us today and for always. It seems like just yesterday that Eldon came into our life. What a joy he has been all these years. I'll never forget the time he came home from school and told me he thought he was going to flunk 5th grade. I said "Eldon, that's negative. You have to be positive." He said, "Mom, I'm positive I'm going to flunk 5th grade." You know, Stan and I have been together a long time. People ask me how we did it. Well, we made a pact a long time ago - the first one to pack up and leave has to take the kids. And we take time for romance. Two times a week, we go to a nice restaurant, a little wine, good food and companionship. He goes Tuesdays. I go Fridays. And Stan "tries" to compliment me - the other day he told me that God made me "beautiful but dumb." I said, "Yes, Stan. He made me beautiful so you would love me. And he made me dumb so I would love you." Sara, just keep in mind that husbands are a handful. I remember the day Eldon was born, Stan called the hospital in a total panic and yelled, "My wife is pregnant, and her contractions are only two minutes apart!" The doctor said, "Is this her first child?" Stan said, "No, you idiot! This is her husband!" So they are not always the brightest bulbs on the tree. Nonetheless, I love him. And - like ours - I know the love between Sara and Eldon will grow stronger every day. I also look forward to watching the bond between our families strengthen over the years. Ladies and Gentlemen, please raise your glass with me now: To Sara and Eldon, may you live every day as if it were your last, cherishing each other, supporting each other and becoming each other's best friend. Look back on this day fondly for you will remember it as one of the happiest days of your life. And I know, because it is one of the happiest of mine. This mother of the groom speech has all the elements of a pretty good speech. Celia (the Mom), starts off by introducing herself and thanking all the wedding guests for attending. She then tells a few simple jokes, and acknowledges Sara coming into her son's life and what a difference it has made to him. She also gives a 'shout-out' to Sara's family and welcomes them into her own family. She tells a funny story about her son and then rags on her husband a bit, then gives some tongue-in-cheek advice to Sara about husbands in general. She ends with a great toast to the happy couple. 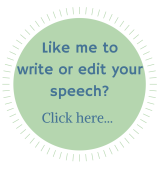 You can take this mother of the groom speech and follow its outline to help you write your own. The details will be different and so will the stories, but the structure should remain pretty much the same.